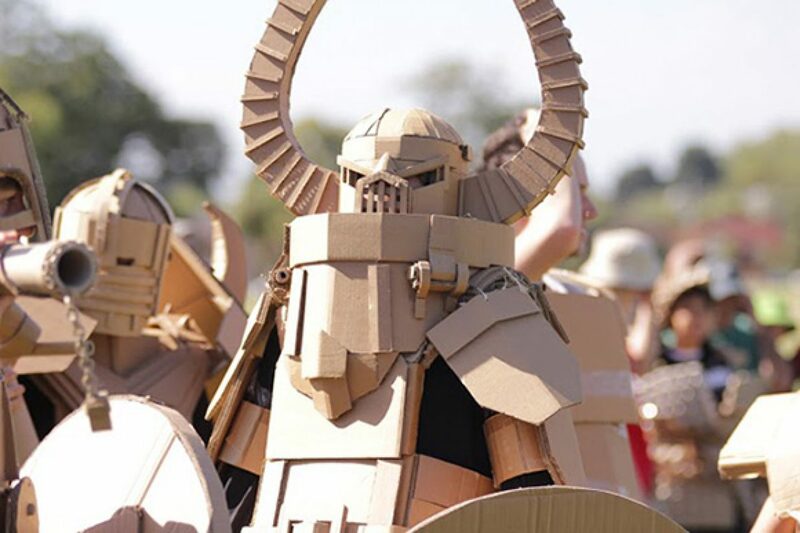 Box Wars - They may call it cardboard... | Planet Paper Box Group Inc.
Boxwars started with humble beginnings as a group who built armour using cardboard. It has become an epic event called a ‘battle’ where the point is to build something from cardboard, then destroy it, which destroys the point. No one has yet won a battle as there are only losers in Boxwars. The creators of Boxwars are the Boxwars Supreme Overlords. They have been running Boxwars from the inception, and are credited with the concept and development of Boxwars. The Supreme Overlords are Hoss & Ross Koger. The first Boxwars battle now known as Boxwars 1: The Beginning, was held on the 26th January 2002 in Melbourne, Australia. This epic encounter came about by our need for a creative outlet, whilst recognising the fantastic material which is CARDBOARD. With cardboard we quickly discovered had brilliant properties for engineering. The limits of scale and awesomeness were continuously pushed to greater heights with the arms race created by constant cardboard war. Boxwars has mastered the ability to show off its skills with cardboard by building HUGE recycled sculptures. The Boxwars Workshop is also travelling to many music festivals around the world, which is especially fun for kids whilst they calmly wait in the wings for suburban glory. Exploring our site will reveal how we’ve adapted our building techniques to a range of different events. Our idea has spread like tumble weed over the globe, and is now practised by a legion of fans. One of our main goals is to bring cardboard back to the consumers who discarded it in the first place without realising its true potential. This we consider a war. After all, the only good reason for a war is a Boxwar!